Adding a toolbar pinned to the bottom of the view port is becoming more common for websites. The idea is to add a bit of functionality, making common links easily accessible at any time. 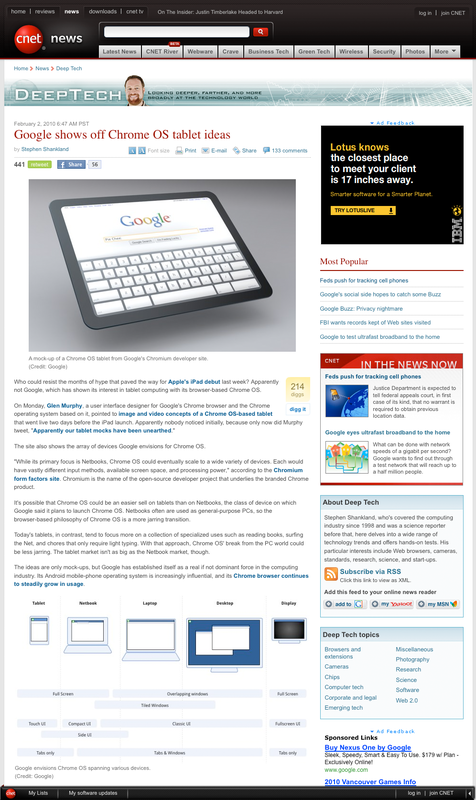 The problem is that it can often give the site a false footer, as is the case with CNET. As you can see with the image above, scrolling to this point of the article can give the reader the impression that this is the end of the article (as it did with me). But, viewing the image below will show you that there is a large amount of content below this point. Because of the design of the rest of the site, mainly the appearance of the header, a reader can mistakenly assume that an article has ended, when they have yet to read the bulk of the content. When adding functionality such as a toolbar like this, make sure you aren’t decreasing the usability of the site in the process. Recently, Microsoft has done a great deal of remodeling to Hotmail. Most is just the transition to Windows Live Mail. The first revision was hard to get used to, as change usually is, but I eventually grew to like it more than the original. There’s all kinds of AJAX functionality to make it more modern and to keep up with GMail. buttons are almost impossible to decipher from the rest of the page. The buttons are little more than text links, lacking and sort of hover event other than an underline. My folders on the left hand side blend in with the rest of the sidebar and even the message pane. What Microsoft needs to do, is accentuate the borders on the individual panes more, create larger, more discernible buttons, and have a hover event that clearly lets me know which button I am about to click on. Microsoft needs to make improvements to their system, not worsen it, or it will never be able to keep it’s customers from moving on to better services like GMail.